When we are young the fair has a magical draw with its rides and stalls, the candyfloss, toffee apples and hot dogs not to mention the music and noise. It seems that this feeling doesn’t change the older you get and so when two of our residents asked if they could go to the St Giles Fair, of course we made it happen. It was a lovely warm September afternoon and so two of our carers pushed Jane and Margaret, two of our residents, down into Oxford to go to the fair. On the walk the two of them enjoyed reminiscing about trips to restaurants as they passed them. The sight of the new Radcliffe Observatory Quarter was also a hot topic of discussion as they recalled stories about the Radcliffe Infirmary from yester year. The St Giles Fair is held each year in Oxford city centre with the rides set up along the length of St Giles. It always brings the centre of Oxford to a standstill for the Monday and Tuesday it is on, with traffic diverted, lots of extra visitors, noise and excitement. Many fairground families return year after year to set up their rides and there is something for everyone, from the traditional funfair rides and amusements like dodgems, a coconut shy, a helter-skelter and an old fashioned carousel, as well as lots of more modern white knuckle rides for thrill seekers. It was so lovely to see the big smiles on their faces as they watched the fairground rides! Jane was keen to go on some of the rides but had to make do with watching others have fun on them. Instead they enjoyed eating some candy floss. They marvelled at the sight of the rides as they propelled people up into the air and listened to the screams of delight as they whizzed back down or round and round. The old fashioned merry go round provided a calmer ride to watch as the little children smiled and laughed as they went up and down on the horses. 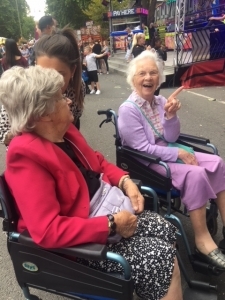 Both Jane and Margaret thoroughly enjoyed their visit to the fair and agreed that it was a fun afternoon out, although Margaret admitted it was a bit too noisy for her!